A great multitude followed the Saviour to Calvary, many mocking and deriding; but some were weeping and recounting his praise. Those whom he had healed of various infirmities, and those whom he had raised from the dead, declared his marvelous works with earnest voice, and demanded to know what Jesus had done that he should be treated as a malefactor. Only a few days before, they had attended him with joyful hosannas, and the waving of palm-branches, as he rode triumphantly to Jerusalem. But many who had then shouted his praise because it was popular to do so, now swelled the cry of "Crucify him! Crucify him!" Upon arriving at the place of execution, the condemned were bound to the instruments of torture. While the two thieves wrestled in the hands of those who stretched them upon the cross, Jesus made no resistance. The mother of Jesus looked on with agonizing suspense, hoping that he would work a miracle to save himself. Surely He who had given life to the dead would not suffer himself to be crucified. What torture must this woman have endured as she witnessed the shame and suffering of her son, yet was not able to minister to him in his distress! Bitter grief and disappointment filled her heart. Must she give up her faith that he was the true Messiah? Would the Son of God allow himself to be thus cruelly slain? She saw his hands stretched upon the cross those dear hands that had ever dispensed blessings, and had been reached forth so many times to heal the suffering. And now the hammer and nails were brought, and as the spikes were driven through the tender flesh and fastened to the cross, the heart-stricken disciples bore away from the cruel scene the fainting form of the mother of Christ. Jesus made no murmur of complaint; his face remained pale and serene, but great drops of sweat stood upon his brow. There was no pitying hand to wipe the death-dew from his face, nor words of sympathy and unchanging fidelity to stay his human heart. He was treading the wine-press all alone; and of all the people there was none with him. While the soldiers were doing their fearful work, and he was enduring the most acute agony, Jesus prayed for his enemies "Father, forgive them; for they know not what they do." His mind was borne from his own suffering to the crime of his persecutors, and the terrible but just retribution that would be theirs. He pitied them in their ignorance and guilt. No curses were called down upon the soldiers who were handling him so roughly, no vengeance was invoked upon the priests and rulers who were the cause of all his suffering, and were then gloating over the accomplishment of their purpose, but only a plea for their forgiveness "for they know not what they do." When he heard the sneering words of his companion in crime, he "rebuked him, saying, Dost thou not fear God, seeing thou art in the same condemnation? And we indeed justly; for we receive the due reward of our deeds; but this man hath done nothing amiss." Then, as his heart went out to Christ, heavenly illumination flooded his mind. In Jesus, bruised, mocked, and hanging upon the cross, he saw his Redeemer, his only hope, and appealed to him in humble faith: "Lord, remember me when thou comest into thy kingdom! And Jesus said unto him, Verily I say unto thee today, shalt thou be with me in Paradise." Jesus did not promise the penitent thief that he should go with him, upon the day of their crucifixion, to Paradise; for he himself did not ascend to his Father until three days afterward. See John 20:17. But he declared unto him, "I say unto thee today" meaning to impress the fact upon his mind, that at I that time, I while enduring ignominy and persecution, he had the power to save sinners. He was man's Advocate with the Father, having the same power as when he healed the sick and raised the dead to life; it was his divine right to promise that day to the repentant, believing malefactor, "Thou shalt be with me in Paradise." The criminal upon the cross, notwithstanding his physical suffering, felt in his soul the peace and comfort of acceptance with God. The Saviour, lifted upon the cross, enduring pain and mockery, rejected by the priests and elders, is sought by a guilty, a dying soul with a faith discerning the world's Redeemer in Him who is crucified like a malefactor. 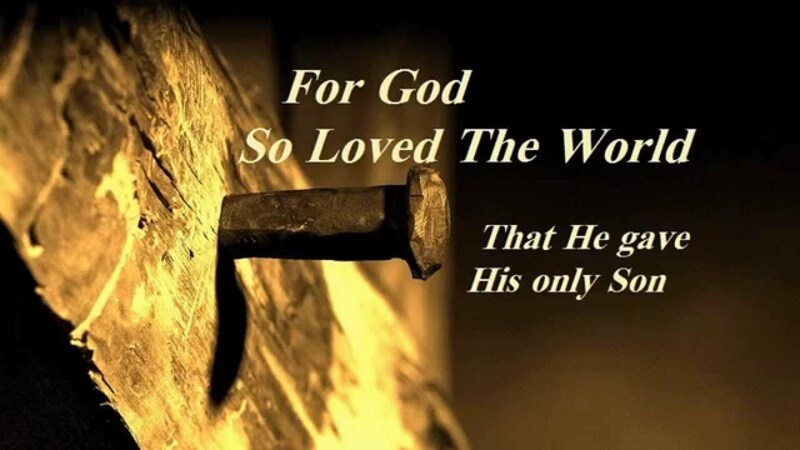 For such an object did the Son of God leave Heaven, to save lost and perishing sinners. While the priests and rulers, in their self-righteous scorn, fail to see his divine character, he reveals himself to the penitent thief as the sinner's Friend and Saviour. He thus teaches that the vilest sinner may find pardon and salvation through the merits of the blood of Christ. The serpent lifted up in the wilderness represented the Son of man lifted upon the cross. Christ said to Nicodemus, "As Moses lifted up the serpent in the wilderness, even so must the Son of man be lifted up, that whosoever believeth in him should not perish, but have eternal life." In the wilderness all who looked upon the elevated brazen serpent lived, while those who refused to look died. The two thieves upon the cross represent the two great classes of mankind. All have felt the poison of sin, represented by the sting of the fiery serpent in the wilderness. Those who look upon and believe in Jesus Christ, as the thief looked upon him when lifted upon the cross, shall live forever; but those who refuse to look upon him and believe in him, as the hardened thief refused to look upon and believe in the crucified Redeemer, shall die without hope. The eyes of Jesus wandered over the multitude that had collected together to witness his death, and he saw at the foot of the cross John supporting Mary, the mother of Christ. She had returned to the terrible scene, not being able to longer remain away from her son. The last lesson of Jesus was one of filial love. He looked upon the grief-stricken face of his mother, and then upon John; said he, addressing the former: "Woman, behold thy son." Then, to the disciple: "Behold thy mother." John well understood the words of Jesus, and the sacred trust which was committed to him. He immediately removed the mother of Christ from the fearful scene of Calvary. From that hour he cared for her as would a dutiful son, taking her to his own home. O pitiful, loving Saviour! Amid all his physical pain, and mental anguish, he had a tender, thoughtful care for the mother who had borne him. He had no money to leave her, by which to insure her future comfort, but he was enshrined in the heart of John, and he gave his mother unto the beloved disciple as a sacred legacy. This trust was to prove a great blessing to John, a constant reminder of his beloved Master. As man's substitute and surety, the iniquity of men was laid upon Christ; he was counted a transgressor that he might redeem them from the curse of the law. The guilt of every descendant of Adam of every age was pressing upon his heart; and the wrath of God, and the terrible manifestation of his displeasure because of iniquity, filled the soul of his Son with consternation. The withdrawal of the divine countenance from the Saviour, in this hour of supreme anguish, pierced his heart with a sorrow that can never be fully understood by man. Every pang endured by the Son of God upon the cross, the blood drops that flowed from his head, his hands, and feet, the convulsions of agony which racked his frame, and the unutterable anguish that filled his soul at the hiding of his Father's face from him, speak to man, saying, It is for love of thee that the Son of God consents to have these heinous crimes laid upon him; for thee he spoils the domain of death, and opens the gates of Paradise and immortal life. He who stilled the angry waves by his word, and walked the foam-capped billows, who made devils tremble, and disease flee from his touch, who raised the dead to life and opened the eyes of the blind, offers himself upon the cross as the last sacrifice for man. He, the sin-bearer, endures judicial punishment for iniquity, and becomes sin itself for man. Satan, with his fierce temptations, wrung the heart of Jesus. Sin, so hateful to his sight, was heaped upon him till he groaned beneath its weight. No wonder that his humanity trembled in that fearful hour. Angels witnessed with amazement the despairing agony of the Son of God, so much greater than his physical pain that the latter was hardly felt by him. At the ninth hour the terrible darkness lifted from the people, but still wrapt the Saviour as in a mantle. The angry lightnings seemed to be hurled at him as he hung upon the cross. Then "Jesus cried with a loud voice, saying, Eloi, eloi, lama sabachthani? which is, being interpreted, My God, my God, why hast thou forsaken me?" As the outer gloom settled about Christ, many voices exclaimed, The vengeance of God is upon him! The bolts of God's wrath are hurled upon him because he claimed to be the Son of God! When the Saviour's despairing cry rang out, many who had believed on him were filled with terror; hope left them; if God had forsaken Jesus, what was to become of his followers, and the doctrine they had cherished? The darkness now lifted itself from the oppressed spirit of Christ, and he revived to a sense of physical suffering, and said, "I thirst." Here was a last opportunity for his persecutors to sympathize with and relieve him; but when the gloom was removed, their terror abated, and the old dread returned that Jesus might even yet escape them, "and one ran and filled a sponge full of vinegar, and put it on a reed, and gave him to drink, saying, Let alone; let us see whether Elias will come to take him down." The darkness was again lifted from Calvary, and hung like a pall over Jerusalem. At the moment in which Christ died, there were priests ministering in the temple before the vail which separated the holy from the most holy place. Suddenly they felt the earth tremble beneath them, and the vail of the temple, a strong, rich drapery that had been renewed yearly, was rent in twain from top to bottom by the same bloodless hand that wrote the words of doom upon the walls of Belshazzar's palace. The most holy place, that had been sacredly entered by human feet only once a year, was revealed to the common gaze. God had ever before protected his temple in a wonderful manner; but now its sacred mysteries were exposed to curious eyes. No longer would the presence of God overshadow the earthly mercy-seat. No longer would the light of his glory flash forth upon, nor the cloud of his disapproval shadow, the precious stones in the breast-plate of the high priest.